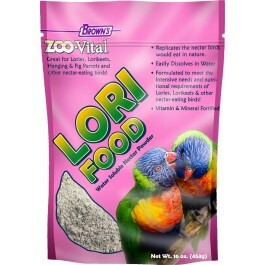 Brown's® Zoo-Vital® Lori Food is formulated to meet the intensive needs and nutritional requirements of Lories, Lorikeets and other nectar-eating birds. 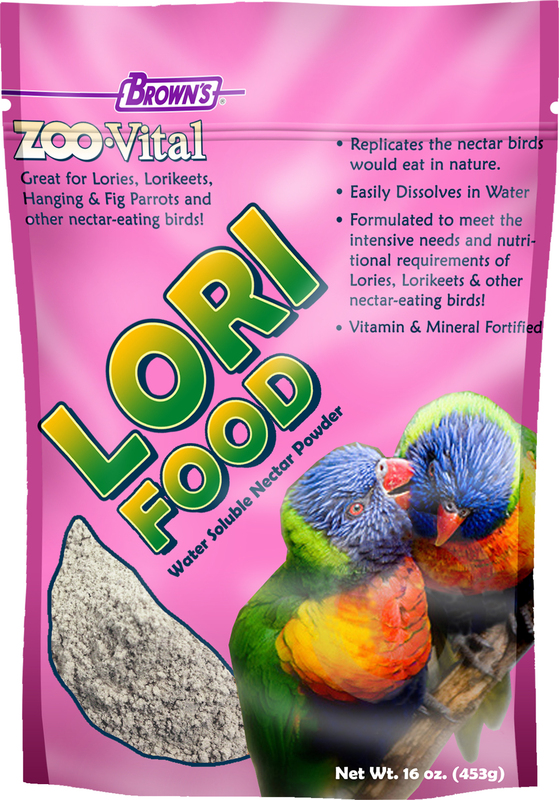 ZOO-Vital® Lori Food is a water-soluble, highly palatable diet in powder form. It’s a vitamin and mineral fortified food, suitable for all Lories, Lorikeets, Hanging Parrots and other nectar-eating birds. Once mixed with water, this food replicated the diet these birds would eat in nature. To further enhance your bird’s diet, fresh fruit can be mixed in for optimum health, fertility and plumage. This blend contains minimal iron… no more than what would be present in the natural ingredient used in this formula. • Formulated to meet the intensive needs & nutritional requirements of lories, lorikeets and other nectar-eating birds. Dextrose, Soy Protein Isolate, Sucrose, Fructose, Dried Bakery Products, Fruit (Concentrated Apple Puree, Pineapple Juice Concentrate, Concentrated Apricot Puree, Concentrated Mango Puree, Banana Puree), Vitamin A Supplement, Vitamin D3 Supplement, Dicalcium Phosphate, Vitamin E Supplement, L-Ascorbyl-2-Polyphosphate, Thiamine Mononitrate, Menadione Sodium Bisulfite Complex, Choline Chloride, d-Calcium Pantothenate, Riboflavin-5-phosphate, Niacin Supplement, Folic Acid, Pyridoxine Hydrochloride, Biotin, Copper Proteinate, Calcium Iodate, Cobalt Proteinate, Manganese Proteinate, Iron Proteinate, Zinc Proteinate, Magnesium Proteinate, Glycerol, Wheat Fiber, Palm Fat, Pectin, Malic Acid, and Flavor (Natural).